Home / Needlework / Crafts from waste: the garbage - in the case! Crafts from waste: the garbage - in the case! In recent times, you can seeunusual crafts from waste. Make them not so difficult, it would wish, free time and a little imagination. By the way, the last point is the most important. If you have developed imagination and fantasy of undistinguished debris can create true works of art. Moreover, the creative process is so inspiring and fascinating that it is simply impossible to stop. What waste can be used to createcrafts with their hands? The answer is simple - different. Suitable everything shells from nuts, eggs, disposable tableware, computer disks, cups of ice cream, plastic eggs from chocolate sweets Kinder Surprise and its analogues. In general, the creative will fit all, and withtime, when you retract into the process, you will already see that you can make with the help of a collection. And for those who are just trying to make crafts from household waste, more will be given a few ideas. As you know, the material for the manufacture of handicrafts diverse. Because and crafts from waste, made with his own hands always turn out interesting and unique. Let's think, and what can be interestingmake to attract children to the process. For example, suggest to the child to make using unnecessary plastic testicles from Kinder surprises livestock farm or men. For creativity you need another markerclay, you can also buy self-adhesive eyes. Plastic egg will be the body to man or animal, using a marker you can draw small details, and plasticine to stick the ears, nose and leg. If you wish to portray such a life-sized chicken, and for similarity obkleyte plastic base feathers and painted with yellow paint. It will turn funny and amusing toy. For creativity with kids is also suitabledisposable tableware. For example, using the plugs and a small piece of tissue is possible to build an unusual fan for a little princess. 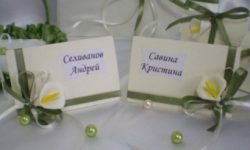 Using disposable spoons make creative bouquet in gift beloved grandmother. Break off from spoons "head"You can lay out a beautiful song, and then put on plastic paint, glitter, glue pieces of colored paper, buttons, in general, to decorate to your taste. 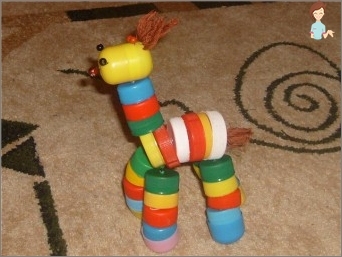 By making these crafts from the waste with the kids, you can not only have fun and to spend time, but also to teach a child to work with different materials, develop imagination and creative thinking. 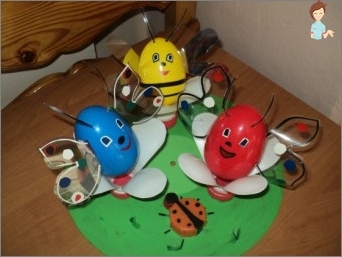 More adult kiddies can offer to makesomething with the help of old burnt bulbs. Very original look of the lights of Christmas decorations. They can be painted with paints, colored paper pasted, tinsel, or come up with some of his options for the transformation of the old one. A little imagination - and this toy will not worse than the store. Using cups of sour-milk products,You can make the bell, decorating it with sequins, beads, colored paper and many others. Such crafts from waste suitable for the school, they can be made to the labor class. Of unnecessary waste can not simply do as wellcreate useful crafts. Do not rush to drag the trash, plastic bottles, bags of juice and trays of eggs. Crafts from solid and plastic waste looks very nice and enliven the interior. You can make creative vases, pencil holders, pots and pots under the flowers - this is not the whole list of utilities that you can create yourself from solid waste. 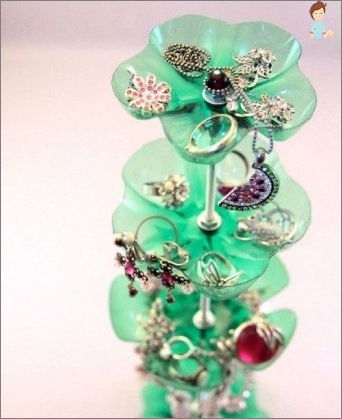 One version of what can be made from plastic bottles is a jewelry stand. This idea is easy to implement, but it looks very original product. Secure each tier to the spoke with washers from twoParties. Check your craft from plastic waste for stability. If it costs well, then the product is ready. 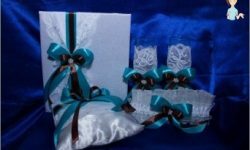 If desired, it can be decorated with beads, crystals and other materials of your choice. 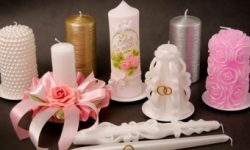 It is worth saying that in the handicraft, the method of manufacturing which is described above, you can add not only jewelry, but also any small items, for example, coins or buttons. As you can see, if you fantasize a little, then withUsing unnecessary trash you can make very creative and attractive little things. And throughout the world, the number of people who create their masterpieces with garbage is growing every year. Citizens turn waste into income, and inIn the direct sense of the word. Master interesting things from junk, people sell their work, getting money for it. So an interesting hobby can become a source of good income. So - try, fantasize, create! It is possible that in a short time your crafts from waste will turn into incomes. In this case, the main thing is to start, but then everything will go by itself. Do not be afraid to create and believe in yourself!